What does it really mean to have a social safety net organized around the principle that, if you work you shouldn't be poor? The American poverty line is neither an absolute measure of what it takes to survive-an estimate of what a basic "market basket" of necessities costs-nor a relative measure, like poverty thresholds in Europe that identify households falling below some percentage of the median income; the figure in the European Union is 60 percent. Instead, it is based on 1950s surveys of the cost of a minimally nutritious diet on an "emergency" or short-term basis (which assumed that a family consumed powdered milk and no fresh vegetables), multiplied by three (at that time, the average family spent a third of its income on food). Since the poverty threshold was set in the 1960s based on these calculations, the dollar amount has simply been adjusted for inflation. Because of the poverty line's odd origins, no one is quite sure what "poor" really means in America, and, perhaps for that reason, hardly anyone likes the official measure. Some on the political right, for example, charge that the threshold is way too high-Robert Rector of the Heritage Foundation argues that it overestimates poverty because few poor Americans truly go without food, most have air conditioners and cable, half have personal computers, and a third even have fancy TVs. "For most people, the word 'poverty' suggests near destitution: an inability to provide nutritious food, clothing, and reasonable shelter for one's family. However, only a small number of the 46.2 million persons classified as 'poor' by the Census Bureau fit that definition," he writes.This is not mere punditry: surveys show that the poor do report possessions that many Americans-especially those of a previous generation-would deem luxuries. Because of this, some economists have called for a new poverty measure based on consumption, not income, arguing that it does the best job of identifying the neediest Americans. In contrast, those on the political left often complain that the poverty line is much too low-little more than a back-of-the envelope, midcentury calculation based on national patterns of consumption that no longer hold; Americans now spend only about a sixth of their income on food, for example, but more on child care and medical costs than they once did. At this writing, the poverty line for a family of four is just under $24,000 in income, or about $2,000 a month. Critics in this camp ask, is there any place in America where a family of four can actually make ends meet on that amount? Columbia University's National Center for Children in Poverty estimates that, on average, a family would need an income of about twice the poverty level to truly get by. Ordinary Americans seem to side with the Columbia University researchers. In 2007, Gallup pollsters asked Americans from across the country: "What is the smallest amount of yearly income a family of four would need to get along in your local community?" The median response was $45,000, with a mean above $50,000. The EITC was designed to bring a minimum-wage worker and his or her family above the official poverty line. The controversy over the poverty line raises the question of whether this is a worthy goal. Some might argue that, if the working poor have Internet and cable TV, supplementing their incomes with a cash transfer from the government is not an appropriate policy objective. Others might contend that, if the working poor are willing to play by the rules-stay employed-it is unjust, even immoral, not to ensure that they have the wherewithal to provide their children with a minimally decent life, as Americans define it. Indeed, for those meeting this fundamental requirement of the American social contract, just getting by may not be enough; those in this camp might argue that society should ensure that they have the real possibility to reach for more. Accordingly, this chapter is devoted to examining the finances of working-poor and near-poor households who claim the EITC. At present, one minimum-wage job will provide an income of $14,500 a year, provided the work is full time and full year. The EITC and other tax credits fill the gap between that figure and the poverty threshold. Here we ask which of the two views of the poverty line is correct. Are people below the threshold truly struggling, or are they blowing money on big-screen TVs and cable packages? We'll find that the answer isn't one or the other, but both. Our logic in addressing this question at the start of the book is simple: if we want to understand the real impact of the EITC, and whether it is worth the cost to taxpayers, getting a detailed look at household budgets is a critical first step. But, as we've indicated, the ultimate question this chapter raises is much larger: What bundle of goods and services is "enough" for those on the front lines of this revolutionary new approach to alleviating poverty, parents who are working but poor? Is it merely about financial need, or should our standard for what is enough be based on American notions of what workers "deserve"? In short, given the fact that these household heads all play by the rules-working, many full time and full year-do they need the EITC, and are they worthy of it? We devote a later chapter (chapter 3) to comparing the new work-based safety net to the old welfare entitlement system that existed prior to the 1996 reforms, and to the time-limited welfare system that remains. Thus we will not engage in a full discussion of those differences here. Note, however, that the old system, which entitled a family to a certain level of resources based on their need, never came close to pulling families above the poverty line. Today, not one state in our nation offers enough in TANF benefits to raise a family much above even half of the official poverty threshold; in fact, in the majority of states, TANF benefits are limited to less than a third of the poverty line, although TANF beneficiaries usually are also able to claim SNAP (formerly known as food stamps) and Medicaid. Nonetheless, the monthly TANF benefit for a family of three won't even pay the rent: it is less than the cost of a modest two-bedroom apartment in any state, and, in twenty-six states it is not even half of that cost.This shortfall is meaningful given the fact that nationally only a quarter of eligible families get any form of subsidized housing, and families with substantial assets are barred from the welfare rolls. Clearly, what remains of the traditional need-based safety net is not-and never was-truly about helping families meet all of their needs. Yet few politicians worry in public, and perhaps few even worry in private, that TANF benefits are too low. What standard of living, then, did Bill Clinton envision ensuring when he proposed a massive expansion of the EITC so that working Americans-at least those with kids-would not be poor? Was it bare-bones survival or something more-some notion of a "decent" standard of living that exceeded subsistence? The narratives we present in this chapter raise the question of what kind of reward American workers ought to get from their labor. We first turn to Ashlee Reed, whose household financial situation is quite typical of that of other households in our study. Ashlee grew up in the South Boston housing projects watching her mother struggle financially while raising three kids on her own. A high school dropout, Ashlee's mom had to take whatever work she could find. Certification as a home health aide translated into long hours taking care of the elderly for little more than minimum wage. Perhaps as a result, she frequently lectured Ashlee and her siblings about the importance of education in the hopes that her children might rise above bottom-of-the-barrel jobs like hers and escape "Southie," the troubled neighborhood in which they lived. Ashlee bought into this message wholeheartedly; she excelled in high school and took out loans so that she could go to college. Four years later, she left with her bachelor of arts degree in hand, becoming the only college graduate in her family. But life has fallen short of the comfortable living promised by her mother's stay-in-school mantra. Now, seven years after graduation, this twenty-nine-year-old white mother lives with her boyfriend, Adrian-who used to work as a cook in her college cafeteria-and their three young children on a run-down block that's just a stone's throw from the one that she was raised on. She is still saddled with $25,000 in educational debt, which she chips away at bit by bit. Because of the slack job market for teachers, she considered herself lucky when she landed a job at Head Start, earning $532 in gross wages per week, or $357 in take-home pay, during the forty-four-week school year. But the job hasn't left her much better off than her mother. The world of welfare has changed radically. As the poor trade welfare checks for low-wage jobs, their low earnings qualify them for a hefty check come tax time—a combination of the earned income tax credit and other refunds. For many working parents this one check is like hitting the lottery, offering several months’ wages as well as the hope of investing in a better future. Drawing on interviews with 115 families, the authors look at how parents plan to use this annual cash windfall to build up savings, go back to school, and send their kids to college. However, these dreams of upward mobility are often dashed by the difficulty of trying to get by on meager wages. 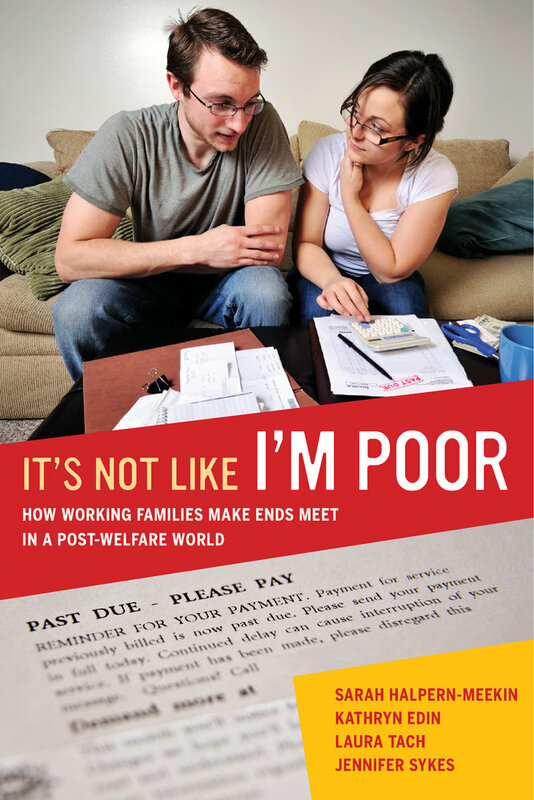 In accessible and engaging prose, It’s Not Like I’m Poor examines the costs and benefits of the new work-based safety net, suggesting ways to augment its strengths so that more of the working poor can realize the promise of a middle-class life. Sarah Halpern-Meekin is Assistant Professor of Human Development and Family Studies at the University of Wisconsin—Madison. Kathryn Edin is Distinguished Bloomberg Professor in the Department of Sociology and the Bloomberg School of Public Health at Johns Hopkins University. She is the coauthor of Doing the Best I Can: Fatherhood in the Inner City, Promises I Can Keep: Why Poor Women Put Motherhood before Marriage, and Making Ends Meet: How Single Mothers Survive Welfare and Low-Wage Work. Laura Tach is Assistant Professor of Policy Analysis and Management at Cornell University. Jennifer Sykes is Assistant Professor of Social Relations and Policy at James Madison College, Michigan State University. 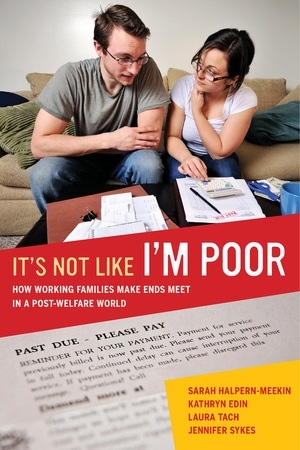 "Humanizes the working poor in an unforgettable way."